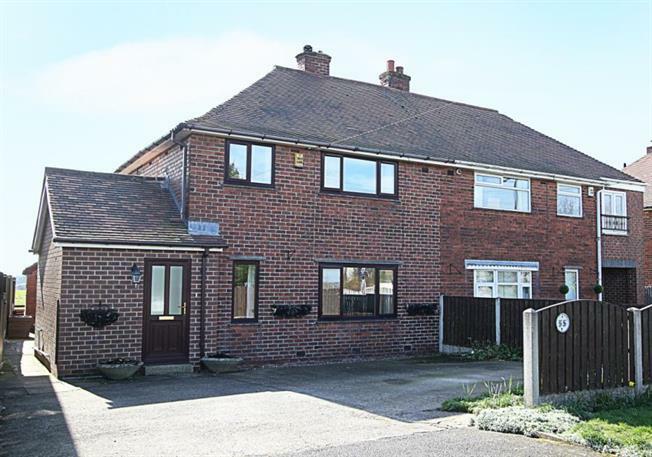 3 Bedroom Semi Detached House For Sale in Sheffield for Guide Price £200,000. Book your viewing today for this extended three bedroom semi-detached family home located within the ever popular location of Marsh Lane! With ample off road parking to the front of the property, open plan dining kitchen and conservatory looking over the enclosed rear garden having spectacular rear views over grazing fields. Stunning views also from the front of the property over Derbyshire countryside and close by to reputable schools! Ideally suited to a family looking for a fantastic location and offering well-presented accommodation throughout, including two reception rooms, log burning stove, ground floor attractive shower room, three bedrooms and family bathroom. Also benefitting from gas central heating, double glazing and a good sized brick built storage house. The accommodation in brief comprises: entrance hallway with stairs rising to the first floor landing, front facing lounge with multi fuel stove, dining kitchen having a range of wall and base units with integrated appliances to include gas hob, electric oven, extractor fan, along with space and plumbing for an automatic washing machine and fridge. The dining area being open plan through to the conservatory where side facing French style doors lead out to the rear garden. Attractive ground floor shower room having wash hand basin, low flush wc and shower enclosure having mains shower within. Tiling to the splash backs, tiling to the floor, ladder radiator, spot lighting and extractor fan. A door leads to a cupboard providing under stair storage. First floor landing: master bedroom with built in wardrobes and over bed storage, double bedroom two with built in storage cupboard, bedroom three and family bathroom having a three piece suite in white comprising: wash hand basin in vanity unit, low flush wc and bath with electric shower and screen above. Laminate to the floor, tiling to the splash backs, extractor fan and airing cupboard. Externally: A good sized driveway provides ample off road parking, side gated access leads to the rear of the property where there is an enclosed lawned garden having a fantastic outlook, with access to a brick built storage house having power and lighting currently used as a log store. Location: The village is steeped in local history, conservation areas and offers a host of superb local amenities, schools and a local supermarket in Eckington. The area boasts a public swimming baths and superb local restaurants and gastro style eateries in the surrounding areas. Ideally situated for links to the M1 motorway networks, Sheffield city centre and nearby Crystal Peaks shopping centre. Renishaw Hall and local surrounding countryside and walks on the Pennine trail provide plenty of choice. The area is popular with buyers of all ages and has excellent bus and transport links.